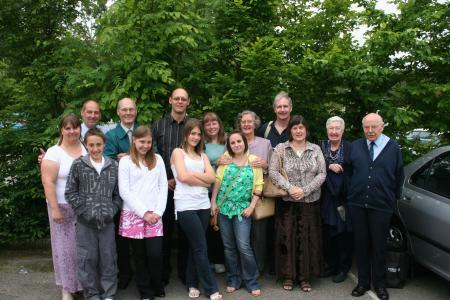 May 25th 2008 was quite a special day for the Gifford branch of my family. It saw a reunion between my Dad - Roger Gifford, ( seated right, second from front ) and his long lost cousin Norman ( seated front right ) after 57 years. Dad was brought up knowing very little about his mother or father's families, and we were somewhat surprised, when out of the blue I was contacted by a young lady who thought we may be related. Alex had been using the Internet to research her family tree and came across our details. After a few emails to compare notes we realised that we were indeed related - my father ( Roger) and her grandfather (Norman) were long lost cousins. It turns out that Dad and Norman had met perhaps a couple of times when they were young, the last occasion being 57 years ago when Roger was a guest at Norman's wedding to Marion. We have a photo to prove he was there, but Dad says he hardly remembers it! So, with some trepidation, a meeting was arranged between the two strands and 3 generations of Gifford clans, firstly at Alex's parents ( Ralph and Sandy ) house, followed by a meal at a local restaurant. Norman and Marion's son Ralph and wife Sandy Gifford, their children Alex and Robert Gifford. Roger and Iris' daughter Sue ( me ! nee Gifford ) and husband Mike (Holton) with son Ross and girlfriend Laura. Roger and Iris' son David Gifford, girlfriend Colleen, and David's daughter Annie Gifford. Within minutes everyone was chatting away as though we'd known each other all our lives. River Valley Golf Club Restaurant was the setting for a great meal, and everyone very friendly and all got along really well. As we talked we discovered all kinds of parallels between the two sides of the family. Earlier Gifford relations had lived in Walderslade, near where David now lives, and there had been another Annie in the Gifford family ( Norman's aunt ) The coincidences continued - Norman and Marion, Ralph and Sandy still live in Medway, near to David, and both Robert and Annie were keen on ski-ing and ice skating often both using the nearby facilities, and now hope to meet up. Also, everyday, Ralph drives down to Manston, to work just a couple of miles from where Mike and I live in Ramsgate. Mike too works in Manston, although for a different company. Anyway, the whole day was voted a great success, and since then we have kept in touch with our newly found extended family.